New York City's got plenty of rivers nearby, but aside from giving Trump more coastal real estate to take over, they don't really do anything. No massive waves that we could use to surf to work, anyhow. 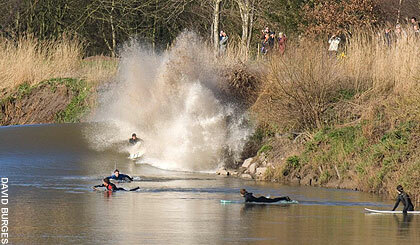 If only we lived near Bristol Channel in England, where a high-tide phenomenon called a tidal bore could be letting us river surf at nearly this very moment. Fun it is. I have tried it once. I remember doing it with my friends when we were little kids.